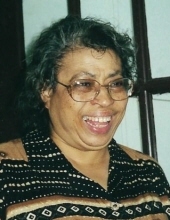 Mrs. Nancy Mae Goode Hoard, 74, of North Chesterfield, VA and formerly of Chase City, VA entered eternal rest at CJW/Chippenham Medical Center, Richmond, VA.
Mrs. Hoard was born in Farmville, VA on June 25, 1944 to the late Florence Idell Davis and Douglas Alexander Goode. She received her education in both Lunenburg and Mecklenburg County public school systems, and at an early age joined Calvary Baptist Church, Victoria, VA. Mrs. Hoard relocated to White Plains, NY where she gained employment as a teacher, and joined Union Baptist Church where she was active in the choir. She later settled in North Chesterfield, VA, retiring from New Deliverance Christian Academy. Left to cherish her memories are her husband of 55 years, Alfonzo Hoard of North Chesterfield, VA; three children, Sharon Morgan of White Plains, NY, Franchon Thompson (Brian) of Coral Springs, FL and Alfonzo Hoard, Jr. of Margate, FL; six grandchildren, seven great-grandchildren; three sisters, Shirley Mallory (Sydnor) of Chase City, VA, Evelyn Hunt (Preston) of Meherrin, VA and LaVerne Keene (Jessie) of Richmond, VA, numerous nieces and nephews, and a vast number of other loving relatives and caring friends. Funeral services for Mrs. Nancy Mae Goode Hoard will be conducted 2:00 P.M. Sunday, February 10, 2019 at Calvary Baptist Church, Victoria, VA with Rev. William Moore III officiating. Burial will follow in the church cemetery. Public viewing for family and friends will be held on Saturday from 10:00 A.M. until 6:00 P.M.
To plant a tree in memory of Nancy Mae Hoard, please visit our Tribute Store. "Email Address" would like to share the life celebration of Nancy Mae Hoard. Click on the "link" to go to share a favorite memory or leave a condolence message for the family.